In a hot climate, it’s great to be cool. Air conditioning lets us sleep and helps us be our best through the hottest days. It’s such a part of our lives that it’s easy to forget that our Columbus air conditioners must be regularly maintained. Some things are easy for the homeowner. Other repairs are complicated, technical and require a professionally certified Columbus HVAC company like Quality Air Heating and Air Conditioning to accomplish. For window mounts or the big units on the side of the house, regular cleanings and a filter change should be a part of every season. It’s not hard to remove the cover and replace the panel of webbing that catches lint and other particles out of your conditioned air. The key ingredient to cooling is a chemical called a refrigerant that is capable of transforming rapidly from gas to liquid and back again at low temperatures. This runs through two intricate tubes, a compressor, and a critical expansion valve that controls the process. It is a delicate and complicated process that calls for expertise and the right tools, especially since the refrigerant is considered hazardous and requires special handling. 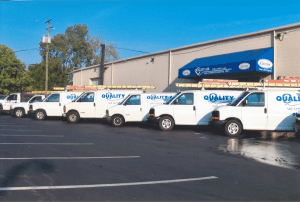 Call Quality Air Heating and Air Conditioning today if you have need any air conditioning repair in the Columbus area!